Sunday August 24 Not quite as warm guess, but pleasant. Being a "grove meeting" south of town, no services in town except at M_E_ church, I didn't attend, Ellery at office or out somewhere most of day, I commenced letter to Aunt Angiolina, filling a sheet during P.M. & eve. Ellery at home in eve writing also, after saying his "catechism". I was over to Rose of errand, but she was off to church. 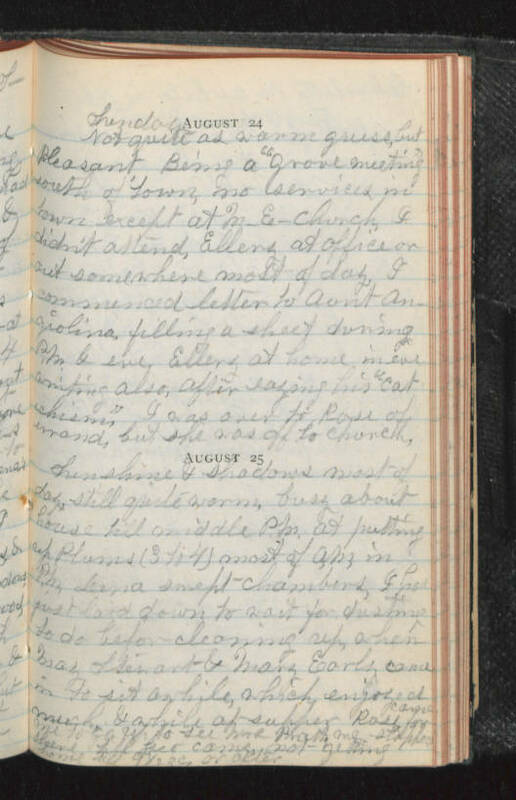 August 25 Sunshine & shadows most of day, still quite warm, busy about house till middle P.M. at putting up plums (3 to 4) most of A.M. in P.M. Lena swept chambers, I had just laid down to wait for dusting to do before cleaning up, when Maz Stewart & Mary Early came in to sit awhile at supper Rose came for me to go up to see Mrs Pratt We stopped there till Geo came, not getting home till 9 1/2 o,c, or after.